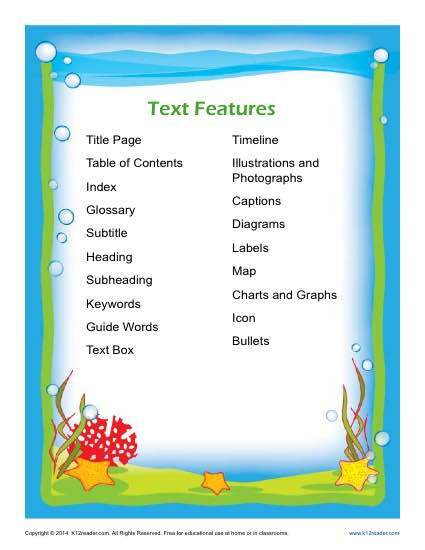 (Click on Get Worksheet below) What are text features? All types of publishing use graphic and organizational features to increase comprehension, separate content, and add visual interest to the text. These enhancements are particularly present in nonfiction works. Knowing how each of these features work helps students locate information quickly and better understand what they are reading. For example, if a student is reading about ancient Rome, a detailed map can be very helpful. Not only will it provide clarification, but some students are more visual and this type of text feature can help them to comprehend, and put into context, what they are reading.